At the most recent Board of Commissioners meeting, township officials gave unanimous support for a $13.5 million bond ordinance issued toward the plan for a new recreational facility, called North Bergen Community Center and Library Complex (NBCC&L) at the intersection of 13th Street and Kennedy Boulevard. North Bergen officially sealed the deal on a five-story facility that will be home to a public recreation center, as well as the township’s new downtown library. 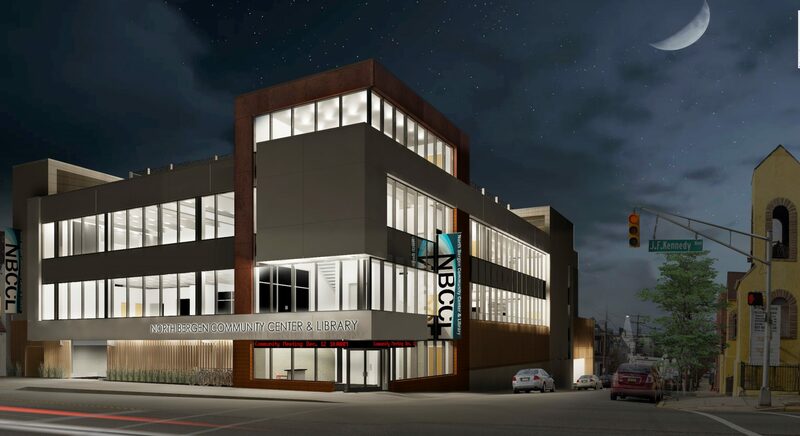 North Bergen’s lease on the current downtown library is scheduled to end this year. “This is sorely needed in the Downtown area, and we believe that it will benefit residents for decades to come.” – Mayor Nicholas Sacco. Mayor Nicholas Sacco cited the need for a recreation space at the location, since downtown park space is relatively sparse compared to other parts of the township. The ordinance was first introduced at a Jan. 9 meeting, during which details and renderings of the new facility were provided. The facility will include two levels of garage parking, in an effort to preserve street parking for neighboring residents. The building will hold a bigger version of the Public Library’s Kennedy Branch with a computer lab, classrooms, study areas, and multipurpose community rooms. Above the library will be a fitness center, including an indoor basketball court with six hoops, fitness classrooms, and an outdoor exercise area. A turf field will be installed on the building’s rooftop. The field will be adequately sized for football and soccer, among other sports. With the project’s anticipated $14 million in bonding costs, township officials will pursue grant funding at the federal, state, and county level. “The language in this ordinance allows us to aggressively go after Green Acres and Open Space grants from the county to reduce the money the township has to borrow,” said Township Administrator Chris Pianese. At the meeting when the project was introduced, Pianese noted that Moody’s Investor Service, a bond credit rating company, recently upgraded North Bergen’s bond credit rating to Aa2. “This rating change will save taxpayers hundreds of thousands of dollars in interest when we receive grants for projects like this,” Pianese said. Pianese said that the township is waiting for state approval to begin accepting contract bids for the project, but that he expects to be able to accept bids in April, and start the job in May of this year. Once bids are accepted, North Bergen officials can look forward to a spring groundbreaking. At the same Jan. 23 meeting, the Board of Commissioners passed a resolution to enter into an agreement with North Hudson Regional Fire and Rescue to provide repair services on apparatus, vehicles, and other equipment, on an as-needed and priority basis. James de los Santos was appointed and later sworn in to fill a vacancy on the Senior Citizens and Disabled Persons Condo/Co-op Protection Board. The township also passed an issuance of $5,130,000 in bonds, in its annual capital program, to cover ongoing construction and yearly costs for services rendered. $770,000 was issued toward road widening, resurfacing, and construction of roads; $800,000 was issued toward routine improvements of the sanitary and storm water sewer system. $1,695,000 was issued toward renovations and improvements to public parks, including lighting, fencing, landscaping, and other needs. $1 million went toward a new ambulance and 4×4 SUVs for the police department. $885,000 was issued toward the maintenance of public buildings, including government offices, court rooms, EMS buildings, Bruin Stadium, the Recreation Center, and the municipal swimming pool complex. $210,000 was issued toward replacing communication equipment, computer equipment, public safety equipment, park maintenance equipment, and maintenance equipment for emergency response vehicles.